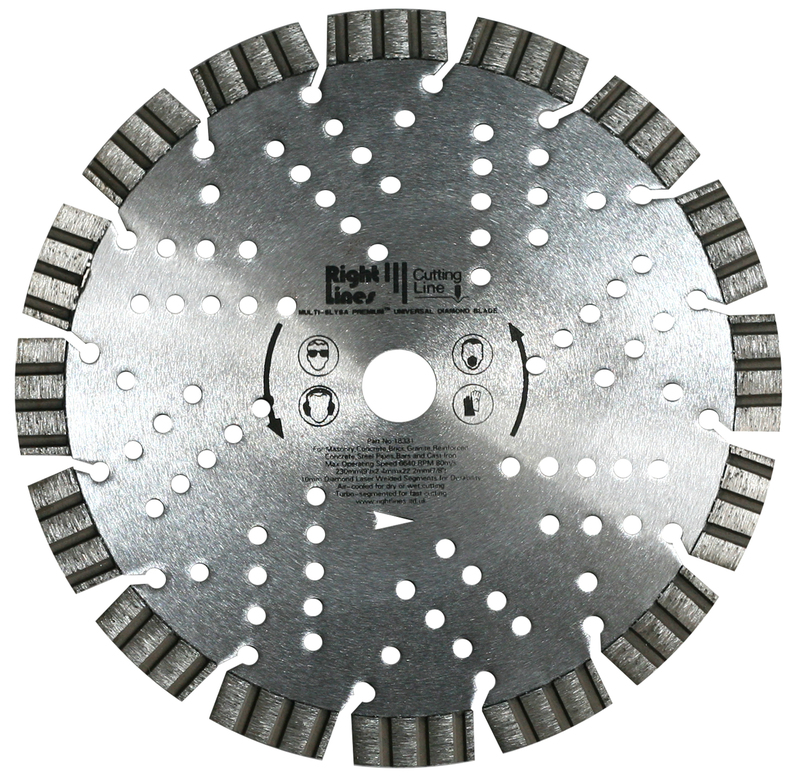 Applications: When you want the best in cutting performance and life, Multi-Slysa Premium Plus diamond blades are an excellent choice. Ideal for hard bricks such as engineering brick, hard stone, including granite and Indian stone, concrete with hard aggregates and other challenging building materials. Will also cut through ductile metal, such as reinforcing bar and scaffolding poles. This is the top specification blade for the professional contractor who wants to get the job done quickly and efficiently. Premium diamond clusters, capable of quickly cutting the hardest building materials. Aggressive turbo style diamond segments speed up the cutting rate and enhance cooling. Massive 15mm deep diamond segments (10mm on 230mm) give long life and exceptional value for money. Cooling holes reduce heat build up and allow some 'through the blade' visibility when cutting. 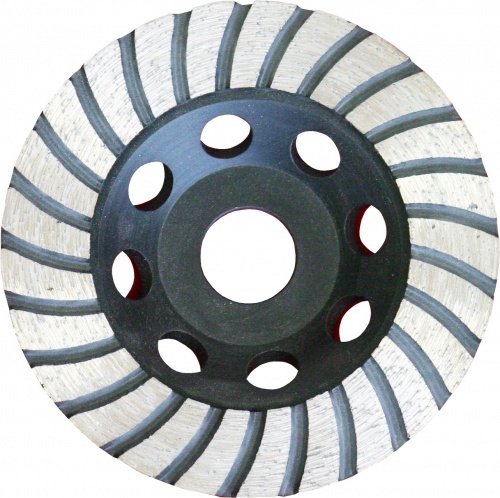 230mm size is suitable for all 9in angle grinders. 300 and 355mm sizes are rated for 100m/s and are suitable for hand-held petrol saws such as Stihl 410 and Husqvarna K760. The 450mm size is ideal for many table and large chop saws and is ideal for cutting hard bricks and block. 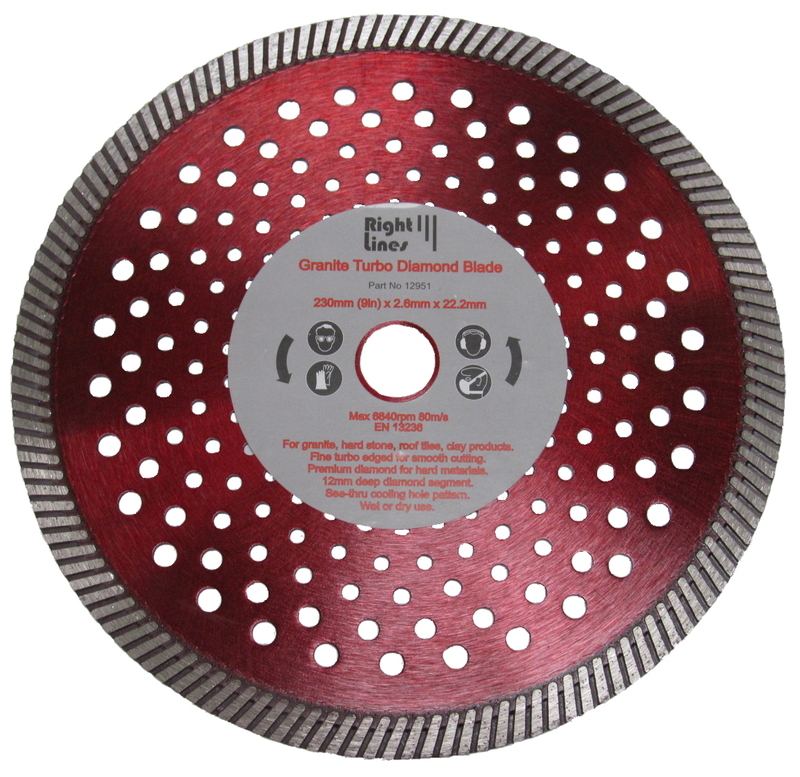 Also Available: For neat, precise cutting of granite slab, we offer granite turbo blades.